We haven't detected any activity in your session in the last 25 minutes. For your security, we'll automatically log you out in seconds. I'm here! Don't log me out. Forgot Your Password or Invitation Code? Enter your email address below to be resent your invitation code. Features to tackle any project, priced to accommodate any budget. EchoSpan's web-based 360-Degree Feedback tool is available in three editions: Starter, Professional and Enterprise. Costs are based on the specific features of each edition and the number of people you are reviewing. Do you have questions about our plans or pricing? We'll be happy to contact you to assist. The Advanced Setup Assistance service engages one of EchoSpan's Senior Client Managers to guide you through the setup process. We will schedule a personal training session, tailored to the needs of your specific 360 process, and provide guidance on setting up and launching your project. You need a review license for each person that is the subject of a 360-degree feedback review (Targets). You do not need review licenses for participants who are providing feedback (Raters) on those Targets. Review licenses include the ability to run unlimited reports. The annual subscription fee provides year-over-year hosting and maintenance of all review data, development plans and reports. In addition, it provides technical support, as well as feature updates for the current year. This fee is waived on Starter and Professional plans when you purchase at least 100 licenses at one time. Looks like you need a price for just one review. Are you looking for a 360-degree feedback review for yourself? If so, try our sister site, www.GrassRoots360.com. Starting at $99, it offers a professional, cost-effective way for an individual to receive 360-degree feedback. If you need to run a review for someone other than yourself, you're in the right place. The EchoSpan development planning module helps employees build and manage professional improvement plans online, leveraging the results from their 360-degree feedback reviews. The module is an additional $0 per user license and, if selected, is purchased for all licenses in an account. Learn more here. The Unlimited license option lets you run an unlimited number of reviews on each licensed reviewee during your subscription year. Standard licensing allows you to run one review per reviewee per license. This is useful in situations where you run semi-annual or quarterly reviews on your employees. to receive a copy of your price quote. to receive an instant copy of your price quote. We're happy to discuss your project with you. Please email us at enterprisesales@echospan.com or call us at 888-300-9978, extension 1, to speak with an EchoSpan Enterprise Sales consultant. We're available from 8am to 8pm ET, Monday through Friday. Complimentary phone support is provided for questions or requests related to system errors, system availability issues, billing or license purchases. Email support is available for all other support inquiries including how-to and setup questions. Email support is usually the fastest way to resolve most problems. Please refer to the complete feature list to fully understand all the features associated with the Starter Edition of the tool. You can access this list by clicking on the "Show All Features" link within the Key Features section of this page. Click "Continue" below to be redirected to our payment site, hosted by PayPal merchant services. You may pay by major credit card or directly via PayPal. A PayPal account is not required. Purchases are usually fulfilled within one hour during business hours. please contact us at sales@echospan.com. Self-service, cost-effective feedback solution. Includes functionality for delivering simple 360-degree feedback reviews. Our most popular edition. 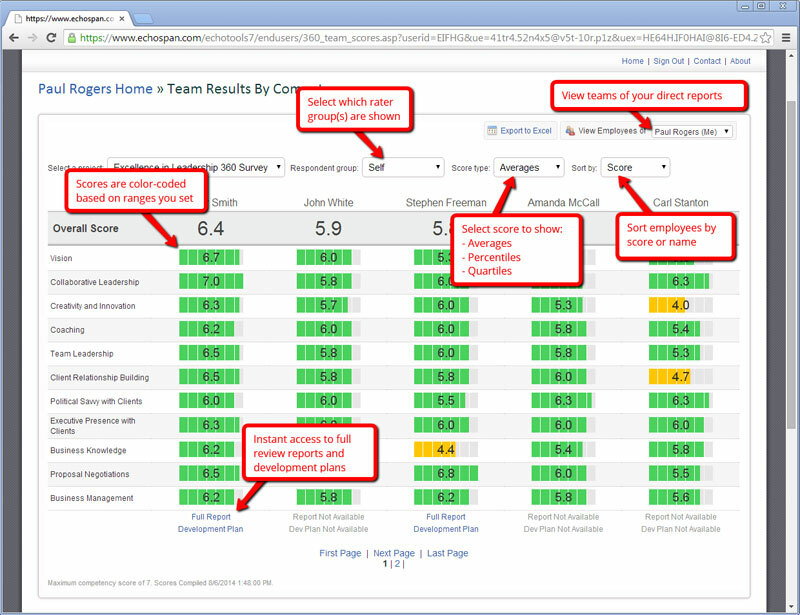 Powerful and flexible features to handle most corporate and organizational review needs. Includes all available features along with dedicated support and premium service levels for large businesses. Allow users to select their preferred language when responding to reviews. Allow users to select their preferred language when responding to reviews. Download project data and manage feedback recipients using the EchoSpan REST API. Email support for administrative user. Phone and email support for administrative user(s). Phone and email support for administrative user(s). 1 Free trial accounts include all "Professional" version features except that only one feedback report can be run and exports are disabled. 2 Unlimited licenses are "named" user licenses and provide unlimited reviews for each licensed user during the subscription period. Unlimited licenses are renewed annually. Please review Section 4c of the Terms & Conditions for more details. 3 Technical support services are provided to up to two trained administrative users. 4 During normal business hours, 8am to 8pm ET Monday - Friday. 5 Requires SAML 2.0. Included as complementary feature for internal use. Additional costs apply if using tool with subsidiary accounts or coaching or consulting clients. 6 Discount percentages are rounded and are to be considered approximate. 7 Data hosting fees may apply. Note: All features involving the connection or integration of databases or applications to EchoSpan are intended for internal use. Additional costs apply if using tool with subsidiary accounts or coaching or consulting clients.